As well as publishing articles online, I have published work in magazines and papers, have written a complete English correspondence course for Bankers, plays, sketches and drama teaching materials. I can express what you need to say, and help business staff to do likewise. My articles at Suite 101 began in April 2010, and as the articles reach a year old, I am republishing them on this site, in the Articles at Suite 101 category. They cover performing arts, circus, politics, House of Commons, psychology, sociology, current affairs, history, travel, teaching drama. They complement my published reviews, also on this website. In July 2011, I was made Topic Editor and Feature Writer in the British/UK Affairs section. Music industry articles have appeared, besides Suite 101, at MusicRadar.com: 11 Songs That Should Be on The Boat That Rocked, 11 Legendary Recording Studios to Rival Abbey Road and A-Z of Bob Dylan and The 13 Essential Bob Dylan Albums to celebrate his 70th birthday, May 2011. The A-Z of Folk Music was timed with the UK’ Cambridge Folk Festival and the US Newport Festival, July 2011. The September anniversary of the death of legendary guitarist Jimi Hendrix, was marked in an article on unusual facts. 11 Reasons Why The Yardbirds were the greatest rock cradle ever was published in March 2012. Sometimes people or businesses don’t want other people to know somebody else is writing their blogs, copy, articles and speeches for them. It’s called ghost writing, and is perfectly acceptable. Indeed, it is popular with a lot of people. Why waste time struggling to put words together if there is somebody who can do it for you? I can be your ghost! I have started publishing articles on East Anglian coastal magazine, Places & Faces. The first was an interview with Ivan Cutting, co-founder and director of Eastern Angles Theatre Company (pages 26-27). The August 2011 edition carried my article about the Great British Beach Hut, As Mad as a Hutter. (pages 26-27). In December 2011 Places & Faces published a piece by me about Jack and the Beanstalk (page 23) at Lowestoft’s Marina Theatre, with some history of the panto genre. A rewritten version of As Mad as a Hutter follows, and the photo above I took for the story, but it was not used by the Editor. The shore-side shed is an essential part of the seaside, along with sandcastles, seagulls and screams of happy children. 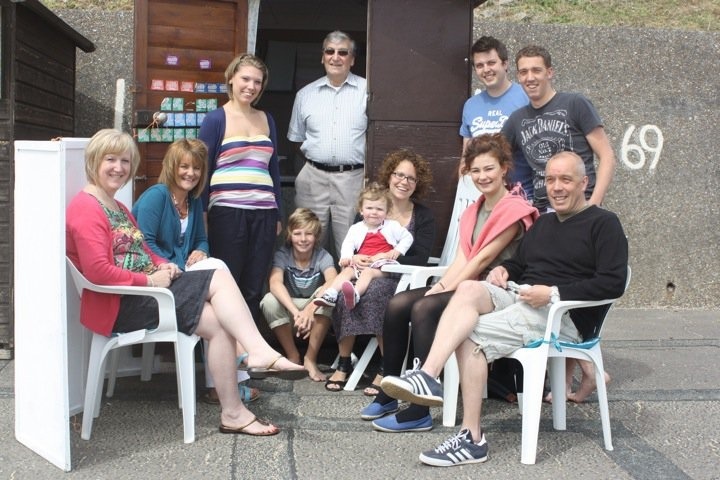 The modest beach hut is frequently passed down the generations, a family treasure. One of many East Anglian families – passionate ‘hutters’ – is the Walpole-Nunn-Porter from Lowestoft. Four generations were on parade to share their pride and joy, standing room for four adults: the immaculately cared for 69a South Beach, below Kensington Gardens. It was back in 1984 after a lengthy wait that Grandad Walpole secured a hut on the plot, from Waveney District Council. It was highly valued by his three children, Jill, Michael and David. Once they were grown and married, their children (Laura, Ricky, Kayleigh, Emily and Liam) loved it too. It was a mini home from home, a static caravan, a base for beach games, shared food, kids’ tantrums and conversations with family and neighbours. It serves through fine days and wet ones, building childhood memories. Now Laura is married to Sam and their first-born Bethany has become familiar with the family hut. They have only once suffered a break in at night (losing some biscuits), although fear of burglary or vandalism is high in some more remote areas that have huts. There is pride in ownership by the large majority of hutters. The family are permitted to reassemble, paint and spruce it up on the plot in late May. They then use it almost every day through the season till October. Mr Walpole was delighted that they put it to good use: ‘Even when it’s a bit dullish, some of us are down here’. The others chorused agreement: ‘Where else can you entertain a family for £10 a day in such amazing surroundings?’ And it is a beautiful spot, handy for amenities and the Claremont Pier, adjacent to Lowestoft’s award-winning sandy beach. Down the coast in Southwold, Tour Southwold asked recently how much would someone pay to own a hut? The answer was £70,000. It has ‘no running water, no electricity and is only leasehold, so you don’t own the tiny piece of land the hut is sitting on, but the views are great and the neighbours are sure to be friendly’. In other coastal areas of England, £70,000 would be cheap. It seems that even if the property market is sluggish, the business in ocean-side boxes is brisk, and there are around 25,000 huts in Britain as a whole. No sleeping within, no toilets, room for storing a few chairs and toys. But they are fashionable. HM The Queen has hers at Holkham Beach, Sandringham; Tracy Emin and Keith Richard are among celebrities who have waxed lyrical about their appeal. Kathryn Ferry, national beach hut expert, called them ‘icons of the British seaside’. Despite their small size, basic facilities and eccentric reputation, their popularity has reached new heights, she says. Often quirky and colourful, huts are a photographer’s dream, a gift to advertisers looking for something British, summery and fun. Kathryn traces beach hut obsession from earlier wheeled bathing machines which sprang up as health benefits of sea-bathing (‘taking the waters’) became fashionable two hundred years ago. She herself became hooked when living in Cambridge and visiting East Anglian huts to take photos, being particularly attracted to Southwold and Felixstowe, at first. She feels each town, every beach has its own unique feel, and ‘of course East Anglia is different, but it’s hard to pinpoint’. The less-hardy don’t see the wide appeal of the shed-by-the-sea: cramped, usable perhaps only a few days a year, vulnerable to vandalism and weather. Yet, as a base for families on a day out, a place to change, boil a kettle, store family paraphernalia and shelter from rain, they are invaluable. Kathryn admitted she can’t afford one yet. She’d hoped to buy one from the proceeds of her book (Beach Huts and Bathing Machines), but prices keep rising. ‘On one hand it’s good that huts are desirable; on the other, it’s sad that people buying as investments price ordinary families out of the market’. She points out that even council-let huts see waiting lists up to a decade long, which is ‘a bit mind-boggling!’. Post election, the winning party leader goes to Buckingham Palace where the Queen invites him/her to form a government if he can ‘command the confidence of the Commons’. The Party leader says that he can command a majority and kisses her hand ceremonially to seal the deal. If he has an absolute majority, he goes ahead and appoints his cabinet and junior ministers, and she rubber stamps the new regime. If there is a clear cut result, then almost always the new government will comprise MPs and Lords from the winning party. If the leader can’t form a government with a working majority because of insufficient MPs, then she will invite the leader of the party that came second. This one may be able to form an administration by bartering cabinet seats and policies with one or more of the minority parties. Following all the revelations about MPs’ expense abuses and other disappointments that have rocked public confidence in the Parliamentary system, many people feel an outcome where parties have to negotiate power to be a desirable outcome. Large numbers of local authorities are used to being NOC – No Overall Control. Here coalitions are arranged which might last the full term of the council or just a few weeks. Such arrangements are always several forms of compromise, like horse-trading, and as such sometimes do not produce decisive local governance. During the last war, Britain was governed by a national unity administration, comprising the best available ministers to work together in the war effort. It clearly worked, though it was temporary. When Gordon Brown became Prime Minister in 2007, he appointed numbers of people to his government with abilities from across the political divide and outside the Westminster village to make up his GOATs – government of all the talents. None is left in office, but still there is talk of a GNU – a government of national unity to serve the nation. However, when we wake up on the morning after the election, we could find Gordon Brown is beginning another five year term – if Labour has more seats than any other party, but not an overall majority. He could offer seats in the cabinet and a couple of their policies given green light to the Liberal Democrats. This occurred between 1977 and 78, when the Liberals agreed to support the minority Labour government in any motion of confidence. Such a deal could be cobbled together again this year. However, David Cameron’s Conservatives could be the largest party but with no overall majority. They could do a Con-Lib-Dem deal on the same terms and so form a government. A straight partnership between Labour and Conservatives seems the least likely outcome given the history of the two parties. Alternatively, the minority parties like Welsh Nationalists, SNP, UKIP, BNP, independents,Ulster parties like UDP or Sinn Fein – could be the grouping that either Conservatives or Labour would seek to woo, either individually or collectively. In fact, depending on how many short Labour or Conservatives are of the majority, it could be that a small handful of MPs will effectively decides who governs next.will be a fascinating time for observers, if nerve-racking for the money markets. Hung Parliaments are rare in Britain, though common in legislatures that have proportional representation. While it will all be a fascinating time for observers (and the Labour Cabinet and the Civil Service would continue to run the country till the impasse was resolved), it will be nerve-racking for the money markets, the economy and the British pound. I am asked increasingly to write material, articles, Qs & As, informative pieces, explanatory, copywriting type work under the general heading of content writing for the web. Much of what I do is done with the client’s byline rather than mine. Need quality web content, written in good English? Get in touch. One Response to "Writing Online, Writing On Paper"
Pretty great article. I came across your website and wanted to mention that I have genuinely enjoyed perusing your blog articles.